I’ve been fortunate enough to be awarded a Henry Moore Research Fellowship to investigate the relationship between British sculpture and structures associated with rural modernity like pylons and transmission towers. I’m really looking forward to spending four weeks in the wonderful surroundings of the Institute’s library and archive looking into this subject. In 1933 poet Stephen Spender notably described the new electricity pylons that were coming to dominate the rural landscape as ‘Quick perspectives on the future’. Using the ancient meaning of pylon as a monumental gateway, Spender saw these structures as offering a view of the future situated very much in the present. Pylons were frequently depicted verbally or visually in poetry and painting of the 1930s and beyond, however modernist sculpture maintains a conceptual distance from such a utilitarian piece of design, even if there is often a visual similarity. Specifically I am interested in the visual correspondences between dramatic interventions in the rural landscape at this time such as the installation of electricity pylons, radio and television transmitters and the accompanying “wirescape”, and sculptural practices such as the use of networks of string to describe space and volume and steel lattice constructed forms. Barbara Hepworth, String Figure Curlew, 1956, brass with string. Examples of these practices include Barbara Hepworth’s many stringed pieces such as Sculpture with Strings (1939/1961) Wood and Strings (1944), and her work Orpheus or ‘Theme on Electronics’ (1956). Lynn Chadwick’s mobile and stabile sculptures from the 1950s have discernible visual relationships with pylon or transmitter structures, as does Naum Gabo’s Model for A Monument to the Unknown Political Prisoner (1952). The work of these artists is predominantly abstract in form, however in many cases they acknowledge inspiration from the natural world or situate their work within particular landscapes. Much writing on sculpture and the landscape aligns it with romantic or picturesque associations of place whereas, aspects of rural modernity which were re-shaping the countryside during this period often go un-noted. 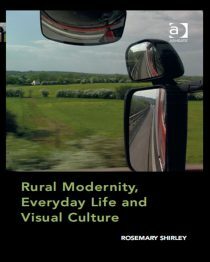 Questions I want to explore are: What are the correspondences between sculptural practice and architectural forms of rural modernity during 1930s-1960s? Is there any evidence that suggests these correspondences were conscious on the part of the artist? How might the formal qualities of volume, negative space and tension contribute to understandings of the modern rural landscape? Can concepts of interconnectivity and changes in the notions of space and time inherent structures such as pylons and wirescapes, contribute new readings of rural modernity and sculptural practice?